How Mazda plans to integrate plug-in hybrid and battery-electric vehicles into its range of increasingly efficient gasoline and diesel models is a topic that interests parts of the global auto industry. In 2019, the small Japanese maker will offer a combustion-engine technology never before achieved in production: a gasoline engine that can work on compression ignition alone under some circumstances, making it considerably more fuel-efficient than competing offerings. Unfortunately, numerous markets—including China, the world's 800-pound gorilla—are starting to talk about banning sales of new cars with combustion engines altogether. 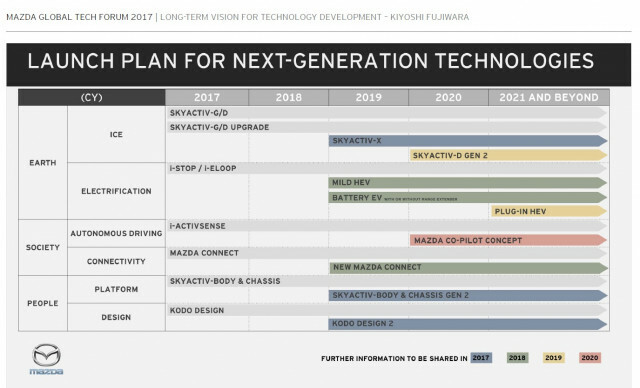 We know that Mazda plans to use Toyota underpinnings for a battery-electric car it will offer in 2019 for the 2020 model year. There will also be a plug-in hybrid model coming in 2021 or later, probably a variation on the next-generation Mazda 3 that will use the new and much more fuel-efficient SkyActiv-X engine. But then there's the big mystery: what about that rotary range-extending engine? Now it appears that Mazda has hinted it will likely use a small rotary engine as a range extender to power a generator in the upcoming battery-electric vehicle. A mid-October article in industry trade journal Automotive News (subscription required) quotes the company's head powertrain developer, Mitsuo Hitomi, as saying he "thinks" a rotary engine will "probably" be used as a range extender in the upcoming electric car. 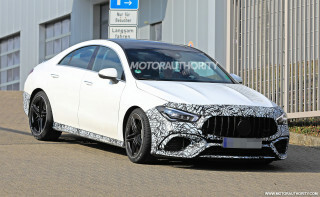 That's probably as close as we'll get to a "yes" from any auto executive talking about a product that won't be launched until the year after next. 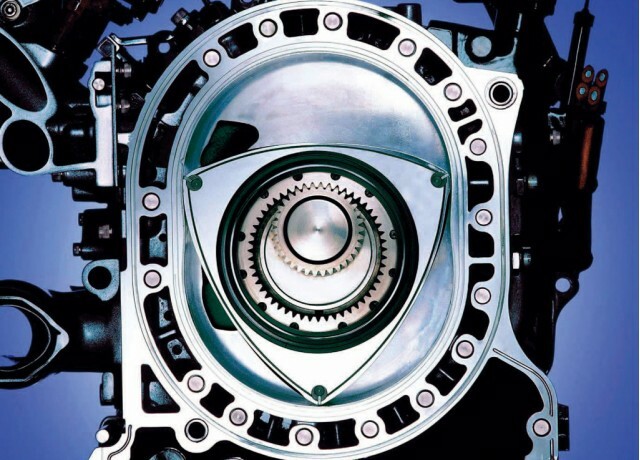 Mazda remained the world's sole maker of Wankel rotary engines for decades after widespread industry plans to adopt them were dropped in the aftermath of the 1973 oil embargo amidst concerns over their high fuel consumption. 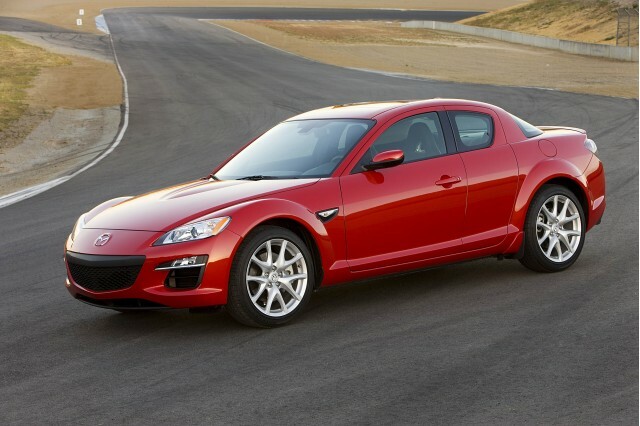 But the last RX-8 sport coupe was sold in the 2011 model year, and while Mazda has hinted at a return of the rotary, it's said little thus far about how it might be used. The company has filed patents for use of a rotary engine as a range extender, which came to light earlier this year. A few hints can also be found in a handful of concept and test vehicles. The Mazda Demio EV was an electric version of the Mazda 2 with a rotary range extender, while the Mazda Premacy Hydrogen RE Hybrid in 2009 was a Mazda 5 minivan fitted with a rotary engine powered by hydrogen allied to a hybrid system for short-range electric power. 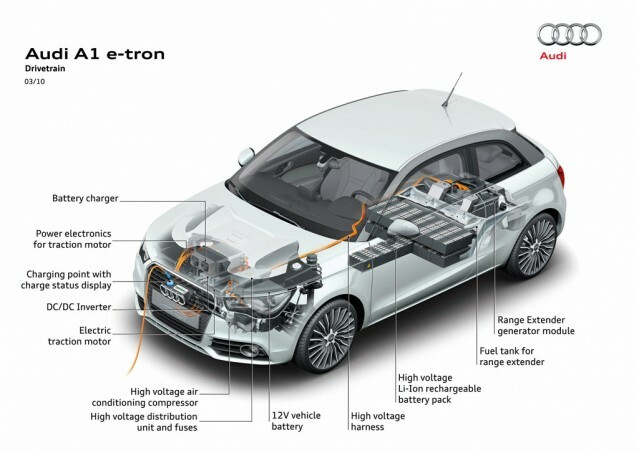 Audi briefly toyed with a small rotary range extender in a prototype Audi A1 e-tron, a range-extended electric version of its smallest hatchback. That Audi project was canceled in 2012 by the VW Group as being too far outside what was then the company's overall strategy for hybrid and plug-in hybrid vehicles. CHECK OUT: Mazda to offer electric car in 2019, maybe with range extender? One irony was that Audi reportedly had to license back rotary-engine technology from Mazda, even though inventor Felix Wankel brought his rotary engine into production in an NSU, a German carmaker bought by Volkswagen in 1969. The great advantage of rotaries is their compact size for the power they put out, though they have historically required careful attention to sealing at the rotor tips and are known to consume considerable fuel for their power. A small, rear-mounted combustion engine acting as a range extender offers the advantage of largely battery-electric power for most trips, and a ubiquitous fueling network for longer journeys when recharging takes too much time. That's the theory behind the two-cylinder REx range-extending engine option in the BMW i3 electric car, but that powerplant's limit of 28 horsepower means that under rare circumstances, it can't keep up. If a rotary range extender solves that problem, it could be a clever and attractive solution to providing longer range in an electric car with a smaller and hence less-expensive battery.